Large self-portrait on canvas, by Jon Imber in 2013. Longtime Stonington summer resident/artist Jon Imber passed away in April following almost two years’ struggle with ALS. Imber was diagnosed with amyotrophic lateral sclerosis, or ALS, a progressive disease that affects nerve cells in the brain, in 2012. Despite that terrible diagnosis, he continued to paint throughout the ensuing months – despite the progressive loss of mobility the disease took from his body. During the summer of 2013, in Stonington, Imber painted over 100 portraits of friends and acquaintances who stopped by his studio on a daily basis. A show of dozens of those portraits was shown at Haystack Mountain School of Crafts Community Center last November, and attended by scores of friends and supporters. Even as the disease took away more mobility, he continued to paint portraits throughout the winter at his Somerville, MA home – painting until just days before he died on April 17th. Filmmaker Richard Kane completed a documentary “Jon Imber’s Left Hand” as part of the Maine Masters project through Union of Maine Visual Artists (UMVA). It will be screened at the Stonington Opera House on July 22nd at 6 and 8pm. and artistic life of one of America’s leading painters – in his own vibrant voice. Jon Imber’s courageous and darkly humorous response to a diagnosis of ALS is a celebration of life and art in the midst of tragedy tracing the switch to his left hand as the condition progresses. Adversity only makes him more determined – a testimonial to the life-giving force of art and love. Jill Hoy and Jon Imber (left). Prior to 1939, Deer Isle-Stonington were isolated fishing communities facing the sea. On June 19, 1939, the Deer Isle-Sedgwick Bridge was completed and dedicated, connecting Little Deer Isle with the mainland. How did the building of this bridge change life on Deer Isle, and in the surrounding mainland communities? In this 75th anniversary year, Opera House Arts at the Stonington Opera House (OHA) is exploring that question in creative ways with students and adult community members on both sides of the bridge. OHA’s new musical, The Last Ferryman, commissioned from Grammy winning composer Paul Sullivan will be given its world premiere at the Opera House August 14-22, 2014. This new musical, like OHA’s previous Dear Fish and Burt Dow performances, is based on historic research and oral histories about the creation of the bridge, materials gathered specifically for this project from community elders by students and adults. The musical is set on Charlie Scott’s ferry – the way to get across the Reach from Deer Isle prior to 1939 – and features as characters Charlie, the last ferryman; Frank McGuire, to whom the bridge is dedicated; Raymond Scott, the treasurer of the original bridge initiative; and other historic community members. Art Rotch, a native Mainer who is now the Producing Artistic Director for Perseverance Theater in Juneau, Alaska, is the scenic designer for the project. Rotch previously designed Women and the Sea, and As You Like It for OHA, both in 2006. An important, year-long component of The Bridge Project is a Local Stories project involving students at the Deer Isle-Stonington and Sedgwick Elementary Schools. Third and fourth grade classes researched local history, and created a permanent mural and a performance based on that research. Students were guided by classroom teachers Judy Rhodes, Tasha Brown and Sharon Longley in collaboration with OHA-sponsored visiting artists Laurie Downey and Gretchen Berg and island historians Tinker Crouch and Connie Wiberg in this multi-disciplinary, integrated arts project. Students interviewed local elders who grew up, lived and worked in Sedgwick and Deer Isle and who shared their firsthand experiences and memories. Connie Wiberg, Bill Haviland, Sylvia Wardwell, Clair Grindle, and Allie Webb have all shared their stories with students and The Bridge Project. Students heard stories of circus animals coming to Deer Isle by ferry; the terrors of crossing the “dancing bridge” (pre-cables); and romances made possible by the bridge. The classes made a field trip to the bridge and Bridge End Park, where they asked questions of engineer Ken Sweeney and Deer Isle resident Loring Kydd. Additionally, students created visual project journals, including both writing and drawings, based on the stories they heard and saw. During a May residency with the visiting artist team, students painted the mural and developed a performance piece based on these drawings and themes from their research. On May 30, the third and fourth grade students unveiled the murals, created with visual artist Laurie Downey, in a celebratory event open to the community along with a performance based on their research directed by theater artist Gretchen Berg. The murals will be hung as permanent installations in the hallways of both schools. The Last Ferryman, directed by Judith Jerome, with original music & lyrics by Paul Sullivan will be performed at the Stonington Opera House August 14-17 and August 21-24: Thurs.-Sat. at 7pm, Sundays at 3pm. Get your tickets early! Change was in the air again this spring as The Factory Tavern on Stonington’s Bayview Street brought two new chefs into the kitchen. 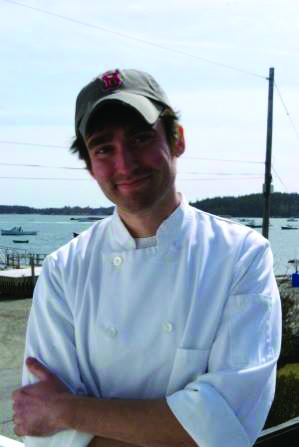 Executive Chef Charles (Charlie) Anderson initially graduated from Bowdoin College, Maine in 2006 before traveling globally and embarking on his culinary career. A graduate of the respected New England Culinary Institute (NECI) he has gained experience in a number of restaurants in New England. Experience at Legal Seafoods’ flagship fine dining restaurant Legal Harborside in Boston provides a foundation in the preparation of seafood; with experience in several smaller restaurants, including those specializing in Farm to Table dining, rounding off his overall experience. His passion is in creating menus that embrace local, fresh produce – presented in his own unique style – with his experience in seafood a perfect complement to our local harvest. Chef Kimberly (Kim) Kral returns home to the island. After graduating from Deer Isle Stonington High School, she also went on to graduate from NECI, where she has specialized in Baking and Pastry. Her experience started on the island, working at both the Whale’s Rib Tavern and The Seasons of Stonington before she left for college. Her experience includes working at artisanal bakeries such as Standard Baking in Portland, and Red Hen Baking Company in Vermont. Her passion and experience for baking and pastry brings the Tavern a unique opportunity to offer diners delicious deserts and breads as part of the menu. Look for exciting desserts at dinner, as well as interesting lunchtime selections that incorporate her experience in baking breads. Neva Beck, nonagenarian owner of The Periwinkle, decided to retire last fall, but we can happily report that the shop will be open this summer under new ownership! Candy and Jim Eaton are taking on the business, and at press time we learned that they would be continuing with some of the old while adding their own personal touch. Stop in, say “hello” and see what they are up to! Another longtime fixture on Main Street – Lester Gallery closed their door for the last time in October. Gallery Mozelle is the new kid on the block – taking over the corner location occupied by Lester Gallery, and looking forward to greeting old and new customers alike. Offering jewelry from owner Maureen Farr (aka Mozelle Fine Jewelry), as well as jewelry by a half dozen or so others, clay, glass, fibers, paintings and mixed media, the new gallery will be open 6 days a week from June through Columbus Day. We also note the closing of Red Dot Gallery – also on Main Street for several years. At press time, there was no word on who or what might take over that space, and we hope you find that something wonderful has stepped in! Out of town, but not out of the way, look for Alfred’s Roost on Eggemoggin Road, in Little Deer Isle. Owner/stained glass artist Dusty Eagan is looking forward to welcoming visitors to her studio and gallery in the old red schoolhouse. And a couple of miles down Reach Road, Pauline Boyce is opening the door to Rumplestiltskin Handspun Fibers this summer. A talented spinner, she will be offering her gorgeous handspun, dyed and natural-colored yarns. Tilia Gallery has relocated from Blue Hill to the Carriage House at 10 Mountain Ash Lane, just off Naskeag Point Road behind the General Store. Stop in and see all the beautiful things that owner Susan Vanderlin has on offer. Sandy’s Provisions – formerly The Cave – has relocated to the center of town. Last fall, the business was sold to new owner, Sandy Buxton, who has moved it – kit and kaboodle – to the former Blossom Studio location on the corner across from the general store and library. Offering gourmet items, fine wines and cheeses, as well as Bucklyn coffee, pastries and sandwiches, Sandy has turned the new location into a delightful place to stop for a bite, some goodies to take home, or ice cream from the takeout window. Seating inside and on the porch provide the perfect place to meet for lunch or a snack. Author and art critic Carl Little wrote the new book William Irvine: A Painter’s Journey chronicling the life and career of artist William Irvine. The book covers the painter’s life in art from his formative years in Troon, Scotland to a visit to his new studio in Brooklin, Maine. After graduating from the Glasgow School of Art and serving in the Scottish army, Irvine came of artistic age in London where he was a part of a lively avant-garde scene. Moving to downeast Maine in 1968 proved a turning point, inspiring bold work that combined Irvine’s abstract instincts with new pictorial concepts based on the landscape. In the ensuing 40-plus years Irvine has established himself as a Maine and American master, known for his seascapes, as well as enchanting figurative paintings and still lifes. The new book features a stunning selection of his work and includes an affectionate appreciation of the artist by novelist Richard Russo. Carl Little is the author of numerous art books and contributes to several publications, including ARTnews, Art New England, Maine Boats, Homes and Harbors, and Island Journal. In conjunction with the book launch, the gallery will also host a solo show for Mr. Irvine of recent work from July 23–August 17. There will be an artist’s reception for the exhibition on July 30 from 5–7pm. Both events are free and open to the public. For more information call 207-667-6611.